A couple weekends ago, I noticed our dog was staring a little too zealously at the dwarf blue spruce tree near our back patio. Ruby counts that tree as her personal property. 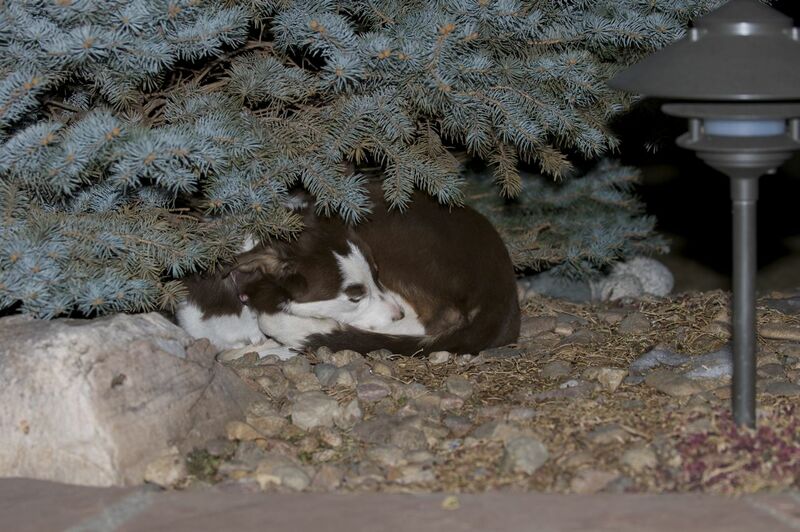 Since the first night that she arrived at our home, a tiny border collie puppy accustomed to life outdoors, she’s claimed ownership for that tree and used it as a protected spot for sleeping. She guards her tree like an old man sitting on his porch and waiting for the next interloper to happen by so he can angrily shout, “Get off my lawn!” But in the spring, nearly every year for the past 11 years, a few renegade birds have chosen to brave the threat of dog, and employ the dense, weighty branches of that tree, branches that barely sway in the wind and provide excellent coverage from rain, as their prime nesting spot. In years past, many nests have been built, many eggs have been hatched. One year, our dog Buddy made a meal of two sparrows from one of those nests and broke my heart. I didn’t care if he was a bird dog. That was bad form. The sight of Ruby staring with a bit too much interest into the middle branches of the spruce gave me PTSD. There were more birds there. Birds Ruby was interested in ingesting. I shooed her away and started poking around to determine the source of her interest. About midway through the tree on the back side, I found her draw. There among the clustered branches was a Eurasian collared dove sitting on a nest. It eyed me cautiously. I began to move some branches to see if I could catch a glimpse into the nest, and with that the bird flew to a nearby tree to watch me. I used one hand to hold the branches down and my other hand to position my phone for a photo. My suspicions were confirmed. 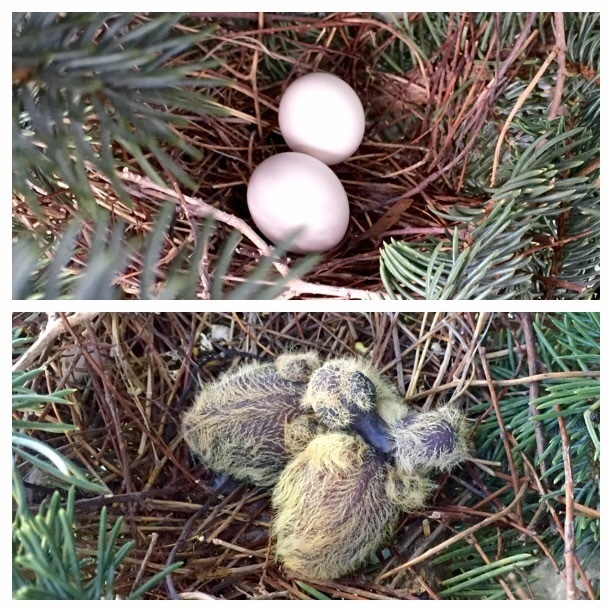 Two small, white eggs sat cradled in the center of a nest made from fallen, Austrian-pine needles. I grabbed Ruby and headed back indoors, curiosity satisfied. I waited about fifteen minutes then snuck back within viewing range of the tree to make sure the nesting bird had returned. The bird was there. The eggs that gave way to birds. Over the next couple weeks, I watched the nest waiting to see if the eggs had hatched. We had a cold, rainy and snowy spell in Denver, and I was anxious about my little yard guests. When the sun finally returned today after a nearly 6-day hiatus to dry our drenched yard, I went out to check the nest. There was a bird on it again. My presence shooed it away, and I peered in and found the two eggs replaced by two dark-colored birds with sparse and pale-yellow feathers. I had to do a double take because the birds, at least I thought they were birds, looked more like threadbare tennis balls with the fuzz nearly rubbed off. With the snow melting from the weekend, the temperature was hovering around 45 degrees so I hurried inside, not wanting those babies to be left in the cold for a second longer than necessary. When I checked on the nest shortly thereafter, the father bird (it is the male birds, I read, that nest during the day while the female remains on the nest at night) was in place on top of the babies. 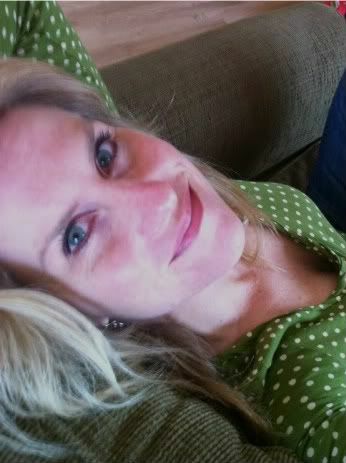 All was right with the world. Good papa. I’m going to be keeping my eye on Ruby over the next few weeks as the baby birds head toward their fledgling state. I’m not up for once again finding out my dog opted for take out rather than nightly kibble. I’d like to know that I helped keep these babies in my yard safe. After all, their parents chose our sturdy, protective spruce tree within close proximity of our perpetually stocked sunflower-seed feeder to raise their brood. Clearly, this shows they have wisdom, not to mention inimitable taste. Tonight, a friend shared a news story about a toddler boy who was beaten to death in Utah, the apparent victim of anger related to his not toilet training quickly enough. I tried to read the article, but never made it past the title and the first line. I just couldn’t stomach it. When I think back to when my precious sons were three and pooping behind the couch and using their spray hose to put out pretend fires on our heavily textured bathroom walls, certainly there were times when I was frustrated. It happens to the best of us. Luckily, most of us are able to cope. Yet, we humans are animals sometimes. While we have the capacity for great good, we also have the capacity for murder. When events like this hit the news, I think about the birds that have nested in my tree. I appreciate the work they are putting into their parenting gig. Even if it is only instinct, it’s a beautiful ritual that plays out every spring, nature setting an example of patience, dedication, and duty in parenting. Maybe that’s why I am drawn to the doves in our tree. They’re a reminder of the good in the world when we’re focusing on the bad can crush the soul. Then I know how fine it is to live.